Welcome to Three Angels Boutique. 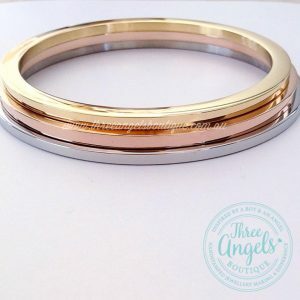 This website www.threeangelsboutique.com.au is owned and operated by Three Angels Boutique (A.B.N 27289072115). Should you choose to engage with Three Angels Boutique, you agree to comply with the following terms and conditions. The term ‘Three Angels Boutique’ or ‘us’ or ‘our’ or ‘we’ refers to Three Angels Boutique, the owner of the website, who is registered under the Australian Business Number office 27289072115. The term ‘you’ or ‘your’ refers to the website user, the consumer or customer. We hold the right to provide exchange or refund at our discretion. Refunds and exchange will only be provided if the item is faulty, and not due to change of mind. PLEASE READ ALL DESCRIPTIONS CAREFULLY BEFORE PURCHASING as your order is a custom personalised order. Read the full RETURN POLICY HERE. It is your responsibility to ensure all spelling is correct in your request for personalisation. Your keepsake piece will be hand stamped or laser engraved according to the directions and spelling you have instructed. If you have any concerns upon receiving your order, you have 14 days in which to contact us via the EMAIL to notify us of your concerns. It is then upon our discretion if a refund, exchange, or any action will need to be taken by us. We will always endeavor to satisfy you within reasonable means. You acknowledge that all products are custom hand stamped or laser engraved by us, and may take time to receive, in particular during peak seasons. You have understood this further by taking into consideration production turnaround and postage time frames as set out in FREQUENTLY ASKED QUESTIONS . This website contains content that is owned or licensed by Three Angels Boutique. This content includes, but is not limited to, the design, layout, appearance, look, images and graphics of the website. Any reproduction of the website’s content is prohibited other than in accordance with the copyright notice, which forms part of these terms and conditions. Every effort is taken to keep the website operating. However, no responsibility is taken by us, and we will not be liable for, the website being temporarily unavailable due to technical issues beyond our control.